DEBORAH CROMBIE: When Thanksgiving falls late in the calendar it seems like we are thrown headlong into the holiday melee. But this year we have a WHOLE WEEK (eight days, to be exact) between Thanksgiving and the first of December. For me, this brings a huge sigh of relief. 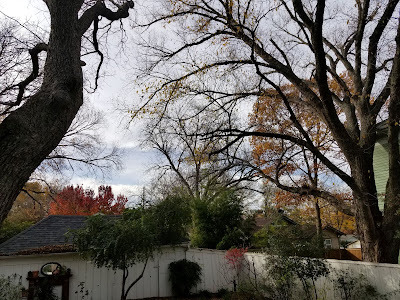 We are still very autumnal here in north Texas, as you can see.We had unusually heavy rains in October, so we have much more color in the trees than we usually see, even so late in the season. And as I missed almost a month of autumn at home when I was in the UK, I'm loving having a week longer to enjoy the turning leaves and crisp golden days, to dream of soups and stews and apple pies rather than Christmas shopping. We actually put up our Christmas lights on the day after Thanksgiving, because it was warm, and because my hubs is a stickler for tradition on that. But our tree (because we get a real one) won't go up until at least the end of the first week in December, and I am only vaguely entertaining thoughts of Christmas presents and decorating. I want to enjoy the end of autumn before it is Christmas and then winter and then the year is gone... Doesn't it seem like we are always being pushed too fast into the next season, the next holiday, without having the chance to savor the moment? Dear Reds, what are you all doing with your extra week? I am writing writing writing madly towards the end--finally--of my book, so for me this extra week is a huge blessing. JENN McKINLAY: Cleaning. All of my deadlines got rolled back this year, so the book that was due on Nov 1 was suddenly due Sept 1 to accomodate the book originally due Feb 1 that was moved to Nov 1. Crazy, right? Needless to say, life became a blur and my house, the frat house, is a disaster. So, I am taking this week to clean because come Dec 1, I have to start working on the book that is now due Feb 1 because I thought I should wedge in another book since I suddenly had a window of time. I need therapy! RHYS BOWEN: I'm afraid this week is all planned out. Monday is our wedding anniversary, Tuesday is John's birthday, Wednesday is packing up and cleaning, Thursday is driving as far as Pasadena, Friday is driving the rest of the way home to Marin, Saturday is attending a Christmas fundraiser. Life has been rather crazy for a while. We have made an offer on a house in Phoenix but just found out the inspection has turned up lots of things we don't like.. so not sure how this will go. Oh, and I'm writing my next stand-alone in my spare time! As for Christmas cards, I haven't even started yet. LUCY BURDETTE: I love the idea of an extra week in November and I have high hopes for this time, beginning with 1000 words a day (channeling Rhys and Jenn here...) And get the decorations up, get the Christmas cards out, start packing gifts for the kids on the other side of the country. However, as I write this, I am desperately craving a nap. Maybe that would get things jump started?? HANK PHILLIPPI RYAN: There's an extra week? Huh. No matter..everything is all stacked up so much that I'm like--what's due TOMORROW? and that's what I do. But the last of the copy edits went in Sunday. Crossing fingers. I need to make a few new book proposals. La de dah. I have about a week to do that. NO problem. (that was sarcastic.) I have a book event every day but Friday! All good, all fun, all crazy. Book cover reveal next week. And then who knows. Holiday cards. Oh, good idea. xoxoxo But the kids were fabulous over Thanksgiving, and best turkey ever. So I am spending my "extra week" if you say so, happy! JULIA SPENCER-FLEMING: Writing, writing, writing. I spent days before Thanksgiving cleaning, shopping and cooking and didn't get ANY writing done, despite the fact I told my editor I'd have the ms done by the end of November. Yeah, not so much. I'm still shooting for early December, though, which means I'm delighted to have breather between Turkey day and the day when we start traditionally getting ready for Christmas - the first Sunday of Advent. It's December 2nd this year, and although I technically don't have to do any decorating at the usual time, one thing going solo has taught me is stick to the schedule! I waited to bring the 2 cords of seasoned wood into the wood room until "after Thanksgiving," thinking I could have some help from the kids while they were around... and instead we got eight inches of snow and freezing rain the week before the holiday. Now I have two cords buried beneath a shroud of snow (don't worry, they're well-covered in tarps.) Am I going to worry about it now? Hell no. It's nothing but writing for me until next Sunday. DEBS: Rhys, happy anniversary to you and John!!! Happy birthday to John!! And good luck with driving and your house adventures! Hallie and Lucy, enjoy a bit of a break. Hank, if anyone needs a few extra days, it's you, xoxo! And Julia, so nice to know that someone else is in exactly the same boat. We will row together! Readers, are you enjoying a little lull between the Thanksgiving and Christmas madness? Tell us what you're up to this week! An extra week is a good thing . . . we’re going to Virginia to visit our daughter and the grandchildren. Happy days!!!! I'm catching up, too, after several no-work days. But one of them included a big party at my house to celebrate my son's wedding locally, so at least the house is clean! I'm trying to finish a short story I agreed to write so I can get going on the next book. You guys have officially made me tired, and it is not even 7 am! I think you all should book a spa day, have a nice meal, some wine and chocolate! Then you can do your writing and holiday prep relaxed and calm. Just a thought! For me, when I'm not doing the regular housework or going to work so I have money to pay for the various bills, I'm doing a lot of writing. Between CD reviews and articles in my Cassette Chronicles series, I've got a new batch of ARCs to read and review. On top of that, there's the various Best of 2018 lists I have to compile. I've been asked to write a couple of entries for the Top 10 list for one of the sites I write for as well. I don't decorate for Xmas, that was something my mother did but I have no use for. And I don't do cards either. There's shopping for Xmas for my nephew which is mostly done. And there's the Xmas party I am going to next week that I have to come up with some sort of costume for the Seven Deadly Sins themed party. That sounds like a fun party Jay, what costume do you have in mind? Lucy, I was going to go as gluttony and spend the night in the kitchen with all the desserts. I was going to dress up as a cheeseburger. Oh, I forgot to mention that each of the rooms in her house will be a different deadly sin. Last year's theme was Dead Celebrities. You either had to go as your favorite dead celebrity or your favorite living celebrity made up to look like they were dead. I went as Bob Ross. Julia, lust would work if the lust room wasn't her bedroom. Ann, his gifts are simple. He's 2. So I got him some Hot Wheels cars and a Tonka police car that has lights and sirens on it. I'm also sending a gift card so his parents can buy him some kind of clothing item because the thing I was looking for up here, I can't find. What Deb says! Life is too short to be living by deadlines. Which is why I retired and haven't done anything useful since. This is Julie's last week working, last Monday morning she has to drag out of bed for the rat race. It is bittersweet, so my job this week is to keep everything moving quietly, good food, good conversation, and a whole lot of good wine. This morning began with me bringing her coffee in bed. How's that for spousal pampering? The outside lights are up and shining in the morning gloom. The inside decorations, not so much. I used to be over the top with Christmas schmaltz, but the advent (note appropriate word) of Eliot the 24 toed Christmas tree climbing ornament smashing creche destroying cat put a stop to all that. However, she is older now and tends to leave things alone. So for the first time in five years I actually plan to decorate the tree with more than lights, maybe add some bows and bling to the chandelier, and hope the glorious Christmas cactus will hang on another month. Happy birthday, happy anniversary, happy house buying, happy editing, happy writing, happy meeting all deadlines, and happy coming up with that new plot to all REDS everywhere. You're a good wife, Ann. That's A+ spousal pampering. Home from a glorious week in DC with all our kids. We stayed in an AirB&B the size of our first midget apartment (with a much nicer kitchen) and constantly tripped over into each other. Serious pedal-to-the-medal writing all week followed by deep cleaning the house. It's back to work for me, after many glorious days off. We had concerts two weeks apart, on October 30 and November 13, so everything at home pretty much jumped into that proverbial handbasket and trundled off downhill. This past weekend allowed me to refocus on the home front and I was able to clean and cook and decorate (as much as I decorate) and lay plans for the next phase of the everlasting renovation project. I even got some writing done. But now I'm turning toward Christmas, and beyond. Our Christmas concert is on December 17, but I don't have to write program notes for that, so I'll be pecking away at the research necessary for the January concert. The extra week won't exactly allow me to relax, but the pace won't be quite so frenetic. And Lucy? Naps are a vital part of self-care, so go for it! Since winter arrived here in late October, or so it seemed, I never got all my fall stuff finished, especially outside and that's not going to happen now. Maybe I'll get some cleaning done. Or maybe I'll just read some more. Much better use of my time! Happy anniversary, Rhys and John! And I love that John got YOU for his birthday, Rhys! Many happy returns of both days, dear ones. My last houseguest leaves this evening. All three daughters, two sons-in-law, and my big, gallumphing teenage grandson--newly hoarse with voice changing, plus a total of 235 pounds of granddogs, stayed with us for most of the last ten days. I'm exhausted, but completely happy. We had the best Thanksgiving we've ever had, with no drama, and lots of fun meals and celebrations, including my oldest daughter's birthday. It was truly lovely, too, because we spent the actual holiday at the farm for the first time. The dogs loved being able to run around, and the people enjoyed having a roaring fire to sit by. My work for the holidays, except for massive loads of laundry and vacuuming of dog hair/mopping up of slobber, is done now, because we are going to my daughter's house for Christmas. I have a few presents to buy, but that's it, which makes me want to cry with relief. My own "holiday rush" is now pretty much over. My mom and stepfather got married on Thanksgiving--it's really a wonderful anniversary. Well, surely he can remember the date, anyway! We got married on March 1st, for the same reason, so Steve could remember the date. Also, because he happened to be on lecture tour and his Las Vegas stop was on that date. Perfect. Rhys, did you and John get married in London or an English village? Happy anniversary to Rhys and John! Like Gigi, I am back to work after a wonderful five-day break. But I am very appreciative of the extra week in November. It makes the whole holiday season seem more manageable. I have to admit, though, that one of the key things I got out of today's post is that Debs is nearly finished with her next book. Hooray!!! So looking forward to that! We had the grandchildren and children for Thanksgiving, which was fabulous… We said goodbye and they went home yesterday with the annual “giving of the carbs” — where we bagged up all the tempting carbohydrates that I had purchased for the holidays, got them out of our house, and sent out of reach to Brooklyn! We also don't start decorating until the first week of Advent, so next week. The Hubby did say he should have taken advantage of the nicer weather last weekend to bring stuff down, but oh well. We'll get it done. I stopped doing cards years ago when our list dwindled to almost nothing, but maybe I'll dust it off this year. I'll probably spend the week writing and thinking about Christmas presents. My Goodness! It is 5:39 am here on the west coast and just reading thru the posts had left me needing that second cup of coffee. Happy Anniversary Rhys and Happy Birthday to John. You are going to two of my very favorite places. I grew up in Pasadena and drop in to Vroman's at least once a month. Novato is my go to town when I'm in Marin. This week is cleaning and prepping for the Christmas season. The first of the Christmas get togethers is this Sunday so I have some baking to do. To all of you who have writing and editing, reviews and whatever else-- may your muse visit you in your dreams and gift you with the best ideas ever! Lyda, I was born in Pasadena and grew up in Temple City, just a few towns south! I have no idea what that random bit of copy is in my previous post. As I said, very early in the morning! I love having this extra week. I don’t feel nearly as rushed with all the Christmas stuff I want to get done, which is a good thing since I don’t have Christmas lists from anyone in my family yet, so I can’t start shopping. I love Christmas music, so this is an extra week to listen to that. And I hope to have mundecorating mostly done this week as well. Thank you all for cheering us on, whether it's writing, editing, traveling, or just having a little break. I am all for the spa day, Deb, but not until I finish this book! So I opened my computer this morning and read what I'd written and realized I'd forgotten to bring in my car. Now I'm at the car dealer brought it in late. Now that's not a great way to start an extra time, rushing around and feeling... forgetful. Turns out it will take 3 hours for my airbag to be replaced so I plan(!) to get a ton of work done. Hallie, you have a Honda? The airbag replacement is on my list, too--post book!!! But better to do it, right?? I just Googled, and this really is almost the maximum number of days we can have between Thanksgiving and Advent. The earliest possible date for the former is November 22, as it was this year, and the latest possible date for Advent to begin is December 3 - and it starts on the 2nd this year. My house is ridiculously clean, I won't have to cook for several more days (as long as I can stand a turkey-centric diet) and my nest is 100% empty, with the exception of two low-maintenance cats. Stay-at-home writers retreat, here I come! Thank you, Debs! And happy writing to you and Julua. Sending the muse in your direction, with a little pitchfork for Julia if needed! Once I retired, most of my deadlines melted away. Ahhhh. But there are still things to do. Over the weekend I did the cards and they go to be dropped off at the P.O. this morning (makes dusting off motion with hands). Also did some wrapping of gifts which will be sent to far away kids and grandkids. However, absolutely no Christmas decorating has been done, nor will be probably until next weekend. We've cut way back on that, a little on the mantle and the artificial tree gets it's due (we switched from real tree a few years back, so much simpler). The outside lights are up. Most of the shopping is finished. If Christmas was in a week, we could manage it. Meanwhile, there's reading, a very small amount of garden work, and, well, relaxing. I might even have some hot cocoa today. We had a nicer than expected Thanksgiving. There were 7 total; we managed to cram everyone in at the table. I am an anxious hostess so try to avoid it, but I timed it so people arrived right before we were set to eat. Our kitchen was not made for extra people wanting to help cook so this was deliberate on my part. We had plenty of time for visiting during and after dinner. This extra week? Well I have to take my car in sometime since the engine light is on. I was going to put on the outside Christmas lights while the weather was nice. Out of 4 strings to go on the upstairs porch only one works. The other 3 light up only halfway. How can that be? I remember I cobbled 2 together to get "one" string last year. I don't think cobbling is in the picture this year. My husband declared we would go buy some new lights to put up. This from the man who has not put up lights since we moved here 12 years ago. What else. I have to nag him to contact his health insurance to get a new supplemental plan since his current one is cancelled for the new year. I don't want to think about shopping. Please no. Celia, good luck with your move! There is no good time, but right before Christmas does seem to be extra stressful. Although it gives you the option of not feeling guilty over all the Christmas stuff you're not doing! Wouldn't it be lovely if Santa and his elves just did all your unpacking for you? That would be a Christmas present to remember! Good luck with the move. In a couple of weeks I’m going to a gingerbread house-making party, and I hope my gingerbread house looks decent enough to display. I’m enthusiastic but not artistic. And I’m looking forward to those books and short stories that are under way! Isn't it really nice to have that extra time? Rhys, happy anniversary! And happy birthday to John! Quite a busy week for you! Jenn, I am cleaning too! This is a big project that I meant to finish before Thanksgiving. I am pushing myself to finish by Christmas. I am also organizing clothes to donate, Christmas gifts to send and Christmas cards to send. And start decorating. Christmas is my favorite time of the year. And my birthday is the same week as Kate's birthday (the Duchess of Cambridge). And I will be organizing my December books for Instagram. Happy Anniversary to Rhys and John, and Happy Birthday to John! Sounds like a busy week all around for you, Rhys. Oh my, I think the extra week has made me a little lazy in getting my Christmas decorations up. I did put up some decorations through the house, as the grandgirls were here over Thanksgiving, and I wanted some up, especially the twinkling lights across the mantle. The tree, artificial, is finally in the living room, in its box, and it will hopefully go up today sometime. The ornaments will be added gradually this week, if I don't go out of town I may be going to my hometown, with a stop along the way to see my son, and a visit to Cincinnati to see Louise Penny at her stop there next Monday. But, I feel like I've got lots to do here, so the trip is iffy right now. Karen M., I'll be in touch in a few days about the Louise Penny event. I have managed to buy the grandgirls "big" gifts for Christmas, plus some book gifts. I'm going to take a look at Cyber Monday deals today for some other family members. Oh, I did order a cap for my son from Peter Grimm, thanks to Kaye Wilkinson Barley for bringing this hat site to my attention. I was glad for the extra week in that it seems to have given me more time to get some book reviews written and blog posts posted and reading done. I still have tons of reading left to do. I know that it's the same amount of time I always have in November, but having that time between Thanksgiving and December is a mental bonus.